TORONTO, April 14, 2016 /CNW/ - TD Bank Group (TD) today announced it has begun its roll-out of TD MySpend, a new real-time money management app – a first in Canadian digital banking. A companion to the TD app for iPhone or Android, TD MySpend makes it easier for customers to track their spending habits from their eligible TD bank accounts and TD credit card accounts with instant notifications on how and where they're spending their money. Starting today, customers with Android devices can download the TD MySpend app and also update to a new version of the TD app, needed to work in conjunction with TD MySpend. An iOS version of the TD MySpend app and the new version of the TD app for iPhone will be available soon. "With daily living costs on the rise, our customers are looking for ways to better manage their spending," said Colleen Johnston, Group Head Direct Channels, Technology, Marketing and Real Estate, TD. "We developed the TD MySpend app to do just that – simple, easy and effortless – it tracks spending from eligible TD bank accounts and TD credit card accounts instantly to help enable customers to make more informed choices that align to their financial goals." The TD MySpend app securely links to a customer's TD bank accounts and TD credit card accounts in order to analyze their transaction history. A traffic-light coloured Spending Insights meter updates in real-time with each transaction to provide a quick snapshot of whether a customer is above, at, or below their typical monthly spending habits. The app also automatically downloads approximately a year's worth of transaction history from these accounts and categorizes each of them, with the added flexibility to switch between categories as needed, eliminating the hassle of having to manually enter expenses and link up accounts. Users will also receive instant notifications of purchases with digital virtual receipts. 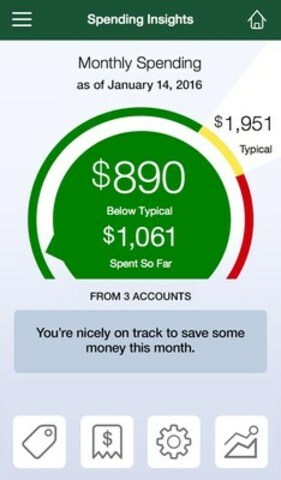 In addition, TD MySpend will provide users with a longer term view of their spending through the Money Path feature. This feature provides a week-to-week view of overall spending for the current month displayed against an average monthly spending trend, making it easy for the user to quickly compare their spending and see if it is tracking more, less or about the same as the previous month. "Money management can be a daunting, time-consuming task with a negative focus on missed targets," added Rizwan Khalfan, Chief Digital Officer, TD. "TD MySpend encourages customers to live their lives by empowering them with real-time knowledge of where their money goes and therefore enabling them to monitor their spending habits and help improve their financial well-being." ™Android and Google Play are trade-marks of Google Inc.